The Chicago L is now 125 years old. 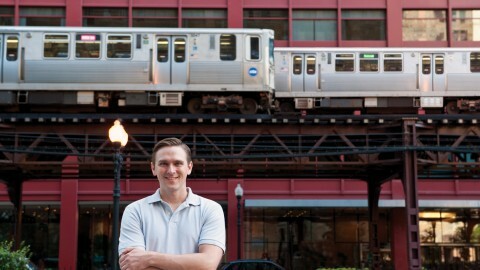 This network of elevated trains and subways is how Chicagoans get around. But it’s also an iconic symbol of the city. 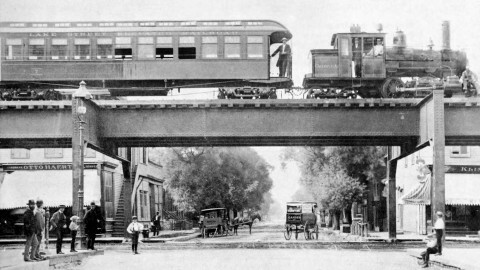 In the late 19th and early 20th centuries, many American cities used elevated trains to transport their residents. 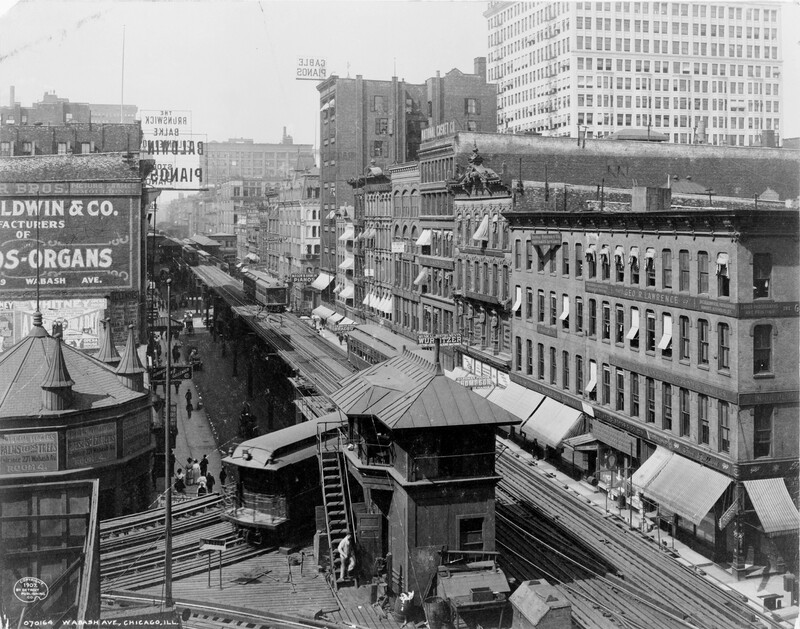 In most cities, those elevated systems were eventually replaced by subways. While Chicago has two subway lines, the majority of our trains are either elevated or at grade (at ground level). 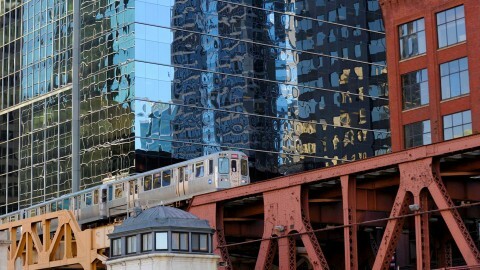 Today, Chicago is the only city in the U.S. that still has elevated trains in its downtown area. Beginning in the 1870s, as Chicago grew at an incredibly rapid pace, private companies laid rail tracks downtown and began introducing streetcars pulled by horses. In the 1880s, these horse-drawn trolleys were replaced by cable car services. But this form of transportation couldn’t handle a high volume of passengers and it added to street congestion. 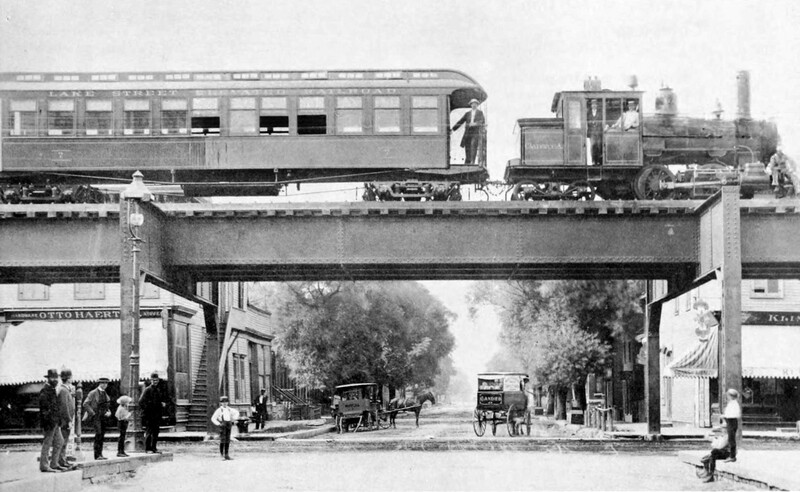 On June 6, 1892, the first elevated—or “L”—train ran from 39th (now Pershing Road) and State streets to Congress Parkway and Wabash Avenue. By 1893, the Chicago and South Side Rapid Transit Railroad extended this line to Jackson Park, the site of the World’s Columbian Exposition of 1893. Today, this section of track is still part of the Green Line. Multiple privately-operated train lines transported Chicagoans in the 1890s. 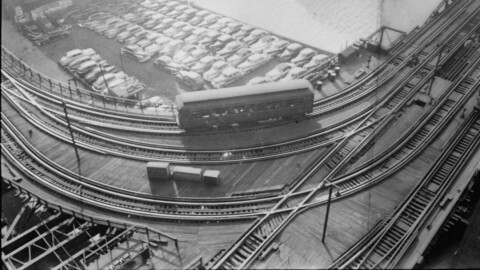 However, these trains deposited people just outside the central business district—an area referred to as “the Loop” due to the cable cars that once created a loop around several blocks. A wealthy and controversial financier named Charles Tyson Yerkes soon changed all of this. Despite his sometimes illegal business practices, he had a lasting impact on Chicago by building elevated tracks above downtown streets to connect train lines together. Yerkes essentially created the Loop L we know today. The first full circuit of the Loop was completed in 1897. Its steel structure was designed by bridge designer John Alexander Low Waddell. The iconic riveted steel-plate form resembles that of the Eiffel Tower (1889) and the original Ferris Wheel (1893). 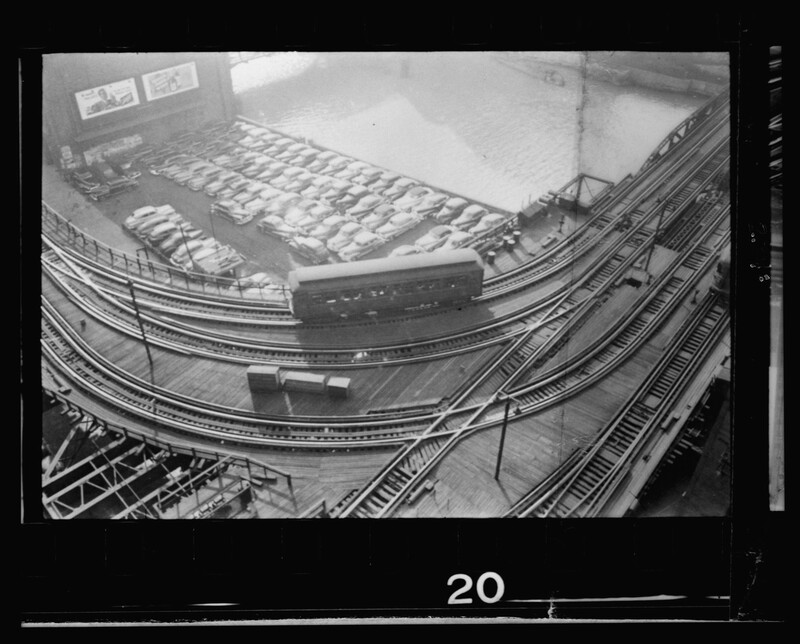 All of Chicago’s trains were either elevated or at street grade until the 1940s. With funding from the Federal Works Agency—part of President Franklin D. Roosevelt’s New Deal—the State Street Subway, now part of the Red Line, opened in 1943. The Dearborn Street Subway, now part of the Blue Line, opened in 1951, following a construction delay during World War II. The CTA is the country’s second largest public transit system after New York City’s MTA. There are eight L train lines, 145 stations and 224 miles of tracks. Nearly 800,000 L rides occur on an average weekday. The Cubs World Series parade on November 4, 2016 catapulted the L to a new record of 1,146,349 train rides in a single day. 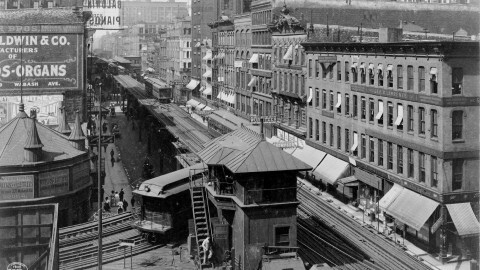 While Chicago’s subways were under construction, another change was brewing for the L. The private companies that operated the train lines were unprofitable. This led the local government to buy the private companies and unify the trains under one entity. On October 1, 1947, the Chicago Transit Authority (CTA) assumed operations of all L trains and streetcars. During the last half of the 20th century, the CTA worked to improve services while also facing a decline in ridership. The suburbanization of the U.S. meant that many Chicagoans moved to the suburbs. A dramatic increase in the use of automobiles and the loss of some government subsidies meant that as ridership fell, so did budgets. 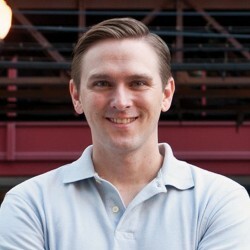 This caused the CTA to cut services and raise fares in order to stay afloat. Despite these setbacks, the CTA introduced some new services. In 1984, L service to O’Hare Airport began. Then in 1993, the CTA started rail service to Midway Airport. Also in 1993, the CTA renamed the rail lines to the colors we know today. This made the system easier to navigate for visitors. At the turn of the 21st century, the CTA introduced modern fare cards. 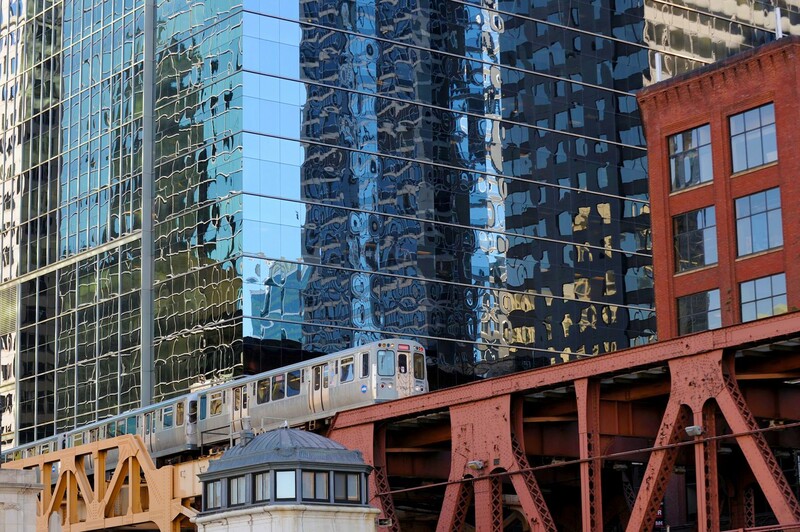 In 2017, we celebrated the 125th anniversary of the debut of the Chicago L. Perhaps providing its best comparison, writer Nelson Algren described our elevated train structure as "the city's rusty heart." 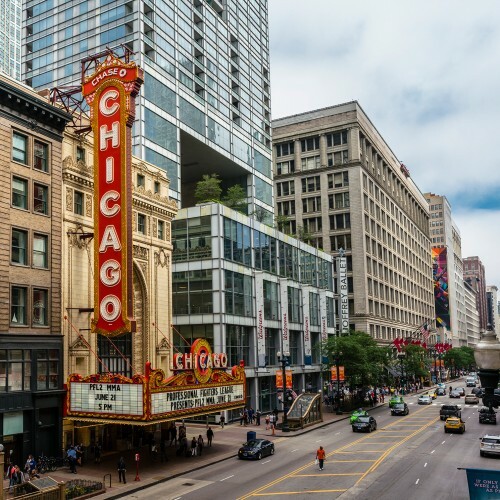 The L gives a pulse to Chicago defining how we all live, work and play. It links together our patchwork quilt of neighborhoods into one cohesive city. While on the platforms and trains, everyone gets a unique perspective of Chicago missed if traveling any other way. Since 2005, the L has consistently served more and more people each year, including several all-time ridership records. 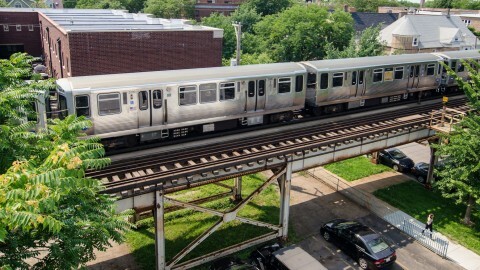 The CTA has invested in new stations and projects to improve L service. The Pink Line opened between the Loop and suburban Cicero in 2006. 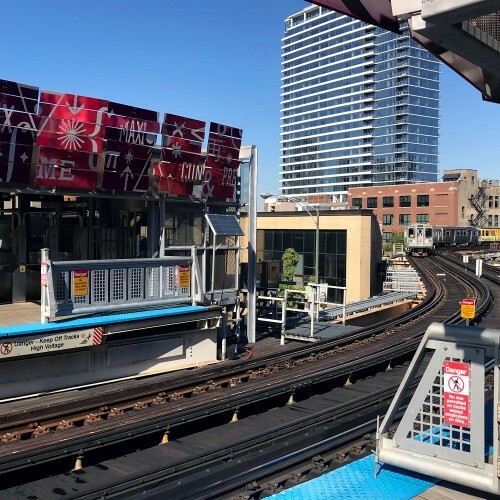 In 2012 and 2015, the CTA opened two new stations on the Green Line to serve the West Loop neighborhood and the McCormick Place convention center, respectively. In fall 2017, a new Loop station opened at Washington and Wabash. In the coming years, the CTA plans to continue revitalizing stations and tracks. They also plan to extend the Red Line further south. 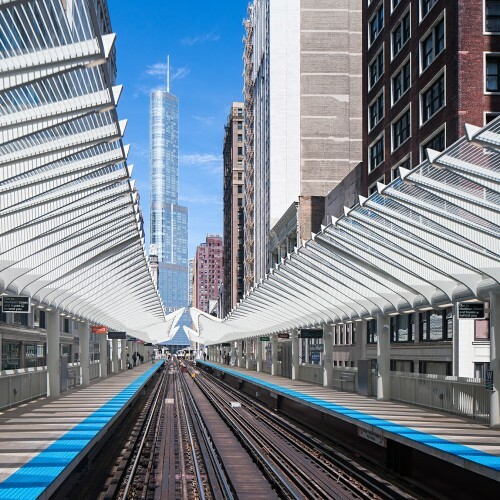 These projects and the CTA’s overall operations depend on many factors, such as government subsidies and population changes. With luck, funding will continue to be available for system improvements and we’ll see more trains running each day. 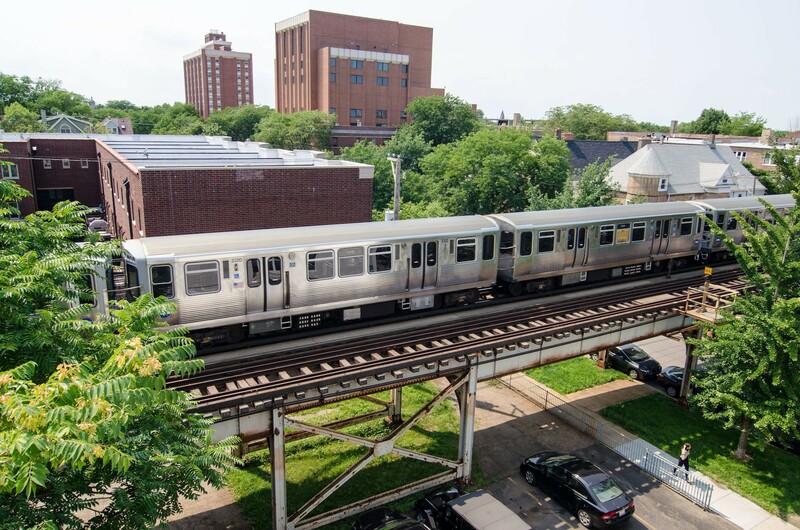 As any Chicagoan can tell you, the sound of an L train passing overhead (deafening as it may be) is a symbol of home and of a city that works.